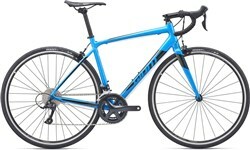 This Giant Contend SL 2 Disc road bike is completely brand new. However, it has a small defect in the paint finish on the top tube, and a small scuff on the handlebar. Having never been ridden, this bike remains in perfect ‘as-new’ working condition and has received a thorough inspection by our professional mechanics. As with all our bikes, it comes with a 12 month Tredz warranty, plus any additional manufacturer warranty which may apply. The lightweight ALUXX SL aluminium frame, with comfortable endurance geometry, combines stable handling with a comfortable all-day riding position. Steering is precise thanks to the OverDrive tapered steerer tube while the oversized PowerCore bottom bracket area ensures that power transfer is immediate and acceleration lightning quick. The carbon bladed fork and carbon composite D-Fuse seatpost offer a smooth ride even over rough road surfaces. Seamless hydraulic disc brake integration offers confident stopping power on all road surfaces and in all weather conditions. The Shimano Tiagra 2x10 speed drivetrain delivers slick shifting performance and features a compact chainset and wide range cassette. This means you get a wide range of gears for taking on all the climbs on your route. 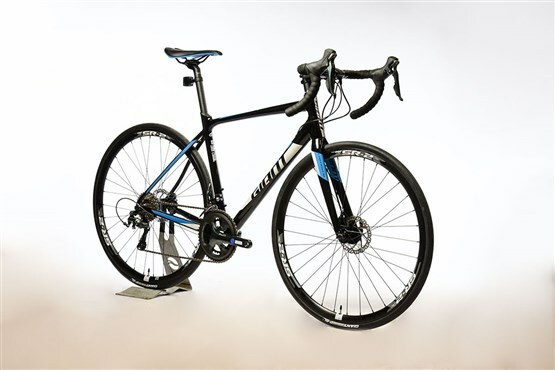 The Giant Contend SL 2 offers a light and lively performance with an added boost of compliance and control.